Feet work hard each day, and it often leaves them tired and dry. SPAPEDICURE®products are formulated to deliver what toes and feet need, creating smoother, younger-looking skin. Marine SPAPEDICURE® uplift and moisturize with specialized blends that are born of the sea. 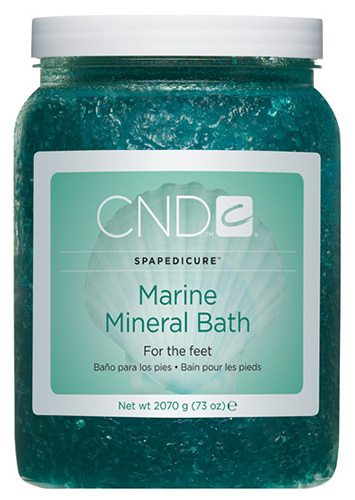 Marine Mineral Bath’s stimulating natural minerals invigorate feet, soften skin, and reduce inflammation. Get toes, soles, and heels ready for further treatments and enhancements when you begin with this delightful foot soak. Follow with Marine Salt Scrub to polish skin and continue with Marine Cooling Masque. Finish the treatment with the silky – but non-greasy – Marine Hydrating Oil. There’s no better way to begin spa pedicure treatments!